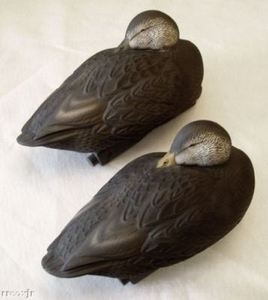 GHG Pro Grade Life Size Sleeper pair Black Duck Decoys make the difference between decoy shy birds and “back-peddlers”!!! -A feeding bird is a safe bird! The Sleeper pose brings a sense of security to your spread. One look from suspicious ducks will convince them to lock and land. These will be the key decoys when it comes to decoying adult or late season birds.